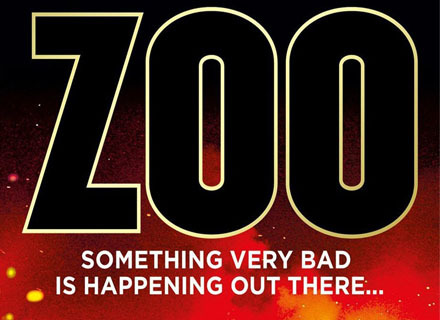 CBS’s Zoo television series began June 30, 2015. It is almost as if the program saw into the future. 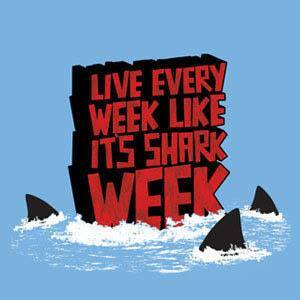 Discovery’s Shark Week, the real kind, apparently already began. There is something going on with the animals. There have been recent attacks by sharks, alligators, sturgeon, lion, tiger, and leopard. Despite the warning signs, in some cases, the humans ventured forth into these encounters. 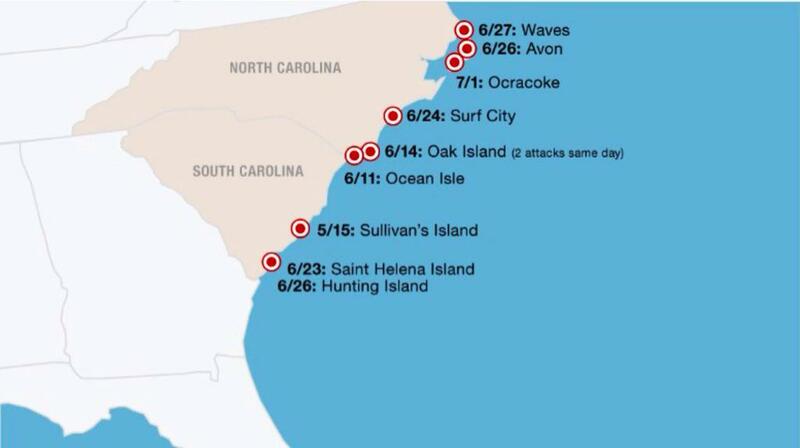 An increase of shark attacks, especially along the Carolina coasts, during the summer of 2015 has not gone unnoticed. 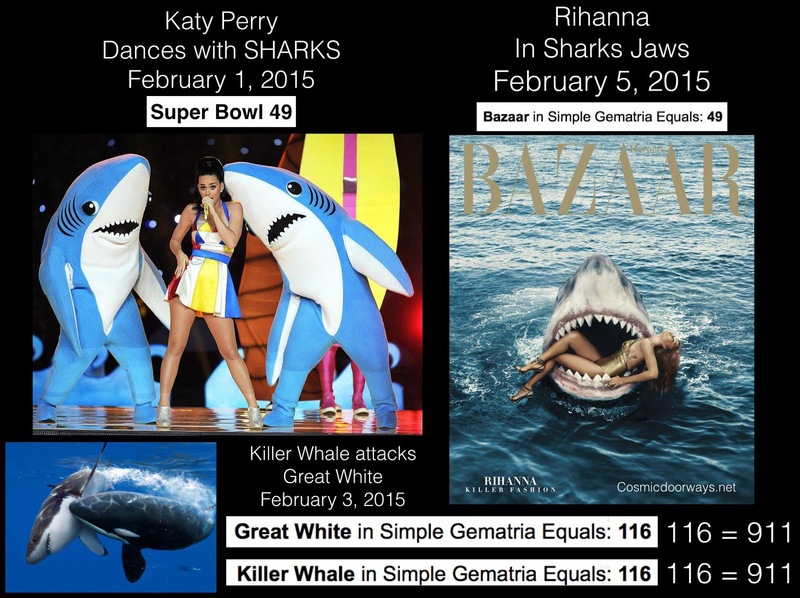 The number is large enough for sharks to become a media story. Last time this happened? 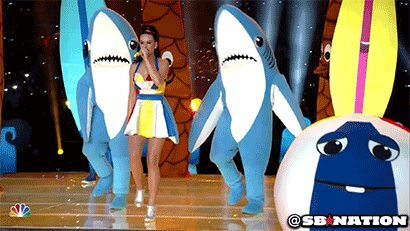 In which sharks became a media focus? 2001. The most recent attack was ironic because it was against a past member of the media. A former editor-in-chief at The Boston Herald suffered serious injuries after he dramatically tried to fight off a 7-foot shark Wednesday [July 1, 2015] off the coast of North Carolina. Andrew F. Costello reportedly came face-to-face with the monster while vacationing with his family at the coastal town of Ocracoke. Costello, 68, was swimming with his son around noon when the attack occurred. “I could see from where I was standing that he had a big baseball-sized chunk of flesh taken off of his leg right above his knee and there was a lot of blood everywhere,” Jackson Fuqua, 15, who witnessed the attack, told The Boston Herald. 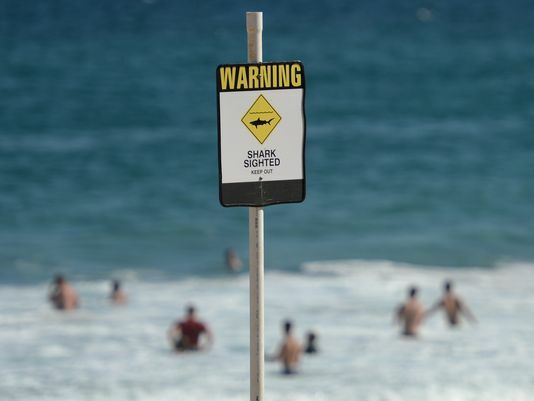 “I saw a big trail of blood from the water to where the man was laying down on a beach towel. There were a lot of EMS workers all around him and they were frantically trying to help him and work to close the wounds he had,” Fuqua told the paper. Costello suffered wounds to his ribcage, lower leg, hip and hands, according to the paper. He is reportedly in fair condition at Vidant Medical Center in Greenville. 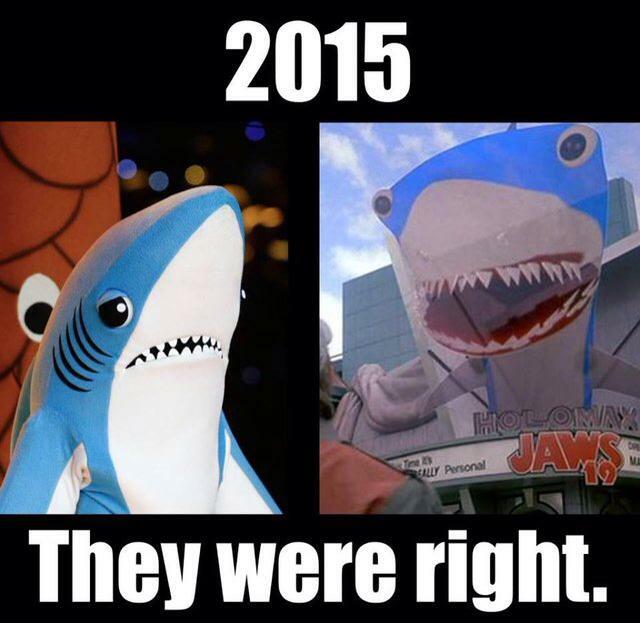 The synchromystic world actually started talking about the “shark imagery” back in February 2015. 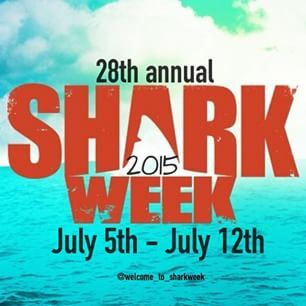 In 2015, on the Sunday after July 4th, it becomes “Shark Week” on the Discovery Channel. 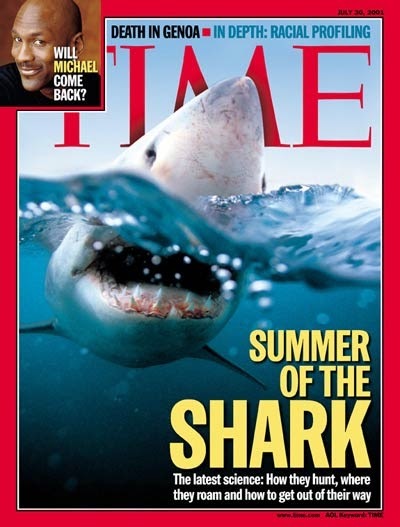 Few remember that during 2001, the “Summer of the Shark” began on the 4th of July. But there was something more sinister waiting in the wings – 9/11, of course. First, however, another animal got the headlines; the “Summer of the Gator” happened too in 2001. 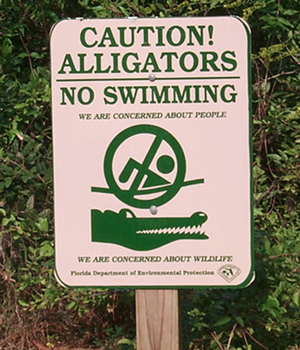 The news for 2015 is now shifting to alligator attacks too. 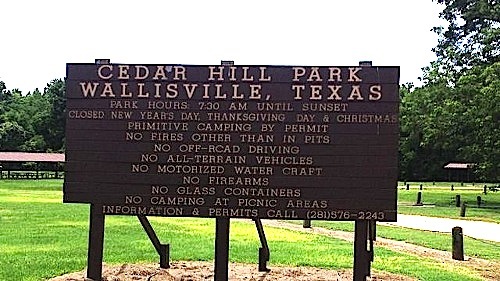 Word reached me from the director of Southern Fried Bigfoot that a violent encounter with an alligator occurred on June 28, 2015, at Charlotte Lake, Cedar Hill Park, Wallisville, Texas. A 13-year-old boy, Kaleb, was swimming near the shore when bitten in the arm and leg by an alligator. The gator also began to pull him under the water. Kaleb’s father, James Hurley, jumped in the water, kicked the alligator off his son, and pulled Kaleb to safety. Both Kaleb and James Hurley are recovering at the hospital. Source. Seventy-five miles away, also in Texas, there was an alligator fatality early Friday morning, July 3, 2015. 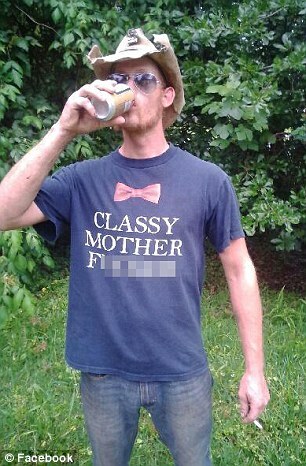 Tommie Woodward, 28, (pictured above, from his Facebook page) suffered severe trauma to a limb when he was attacked early Friday morning at the private marina, which is along a bayou extending from the Sabine River near the Louisiana line, Orange, Texas, police Captain Robert Enmon reported. The alligator was estimated to be 11 feet long. 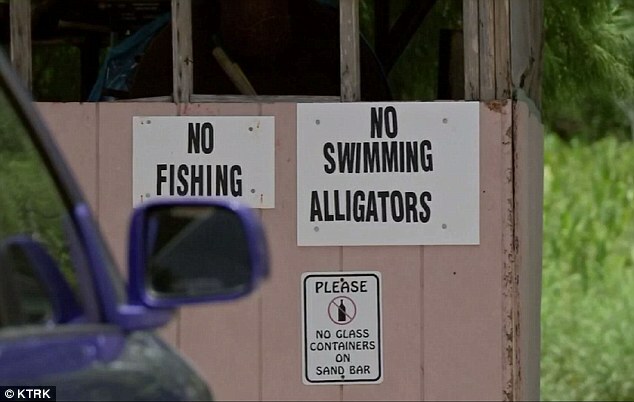 The owners of the marina recently had spotted a large alligator on a few occasions, and put up a sign warning people to stay out of the water, police said. Woodward reportedly when told this, yelled out “F*ck the alligators,” and jumped in. 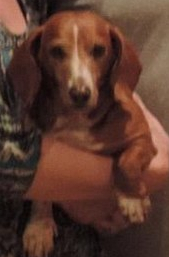 Then on Saturday, July 4, 2015, an 8-foot alligator grabbed Mike Karris’ 11-year-old dachshund, Cody, at the boat ramp in the St. Marks National Wildlife Refuge in Florida. Karris and his girlfriend were unable to rescue their dog. The last attack on a dog was more than 15 years ago. Source. There’s also a problem with leaping sturgeon. 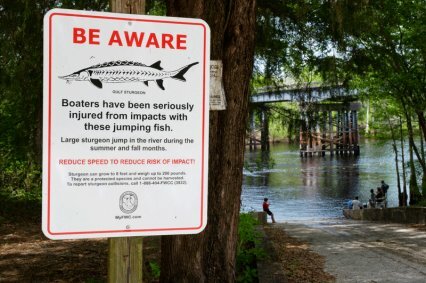 In Florida, boaters are infrequently, but routinely hurt by sturgeon jumping from rivers and colliding into people in boats. On May 23, 2015, on the Santa Fe River, a sturgeon crashed through a boat windshield, injuring the driver of a boat. Early in June 2015, a sturgeon in the Suwanee River in Manatee Springs State Park jumped into a boat with 14-year-old Heavyn Nash and knocked her unconscious. Nash was fishing with her mother and grandfather when the 4- to 6-foot fish decided to join them. Then on July 2, 2015, a fatality took place. A 5-year-old girl was killed after a sturgeon leaped out of a northern Florida river and struck her while she was boating with her family, state wildlife officials said. Jaylon Rippy died after getting hit by the fish on the Suwannee River, south of Lake City, the Florida Fish and Wildlife Conservation Commission said in a statement posted on the Suwannee Democrat Bulletin. Her mother, Tanya Faye Rippy, and 9-year-old brother, Trevor Rippy, were injured by the sturgeon, as well. 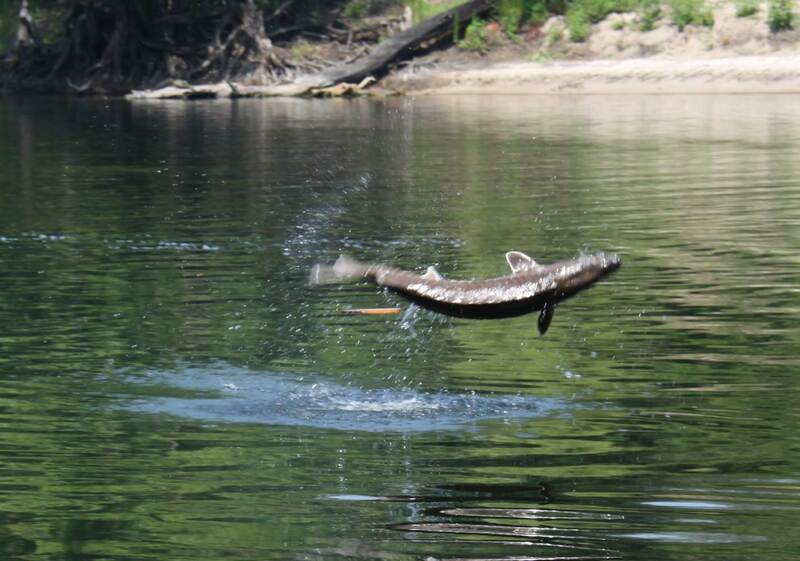 On Friday, July 3, 2015, two adults traveling in a boat on the Santa Fe River between the Suwannee River and a Branford area campground were also struck by a leaping sturgeon, Fish and Wildlife Commission officials said in a statement. Big cats have been in the news too. 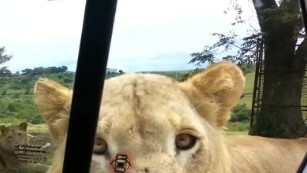 The lion that would kill was photographed moments before the attack, by another tourist (above) and by the victim (below). On June 1, 2015, New Yorker Katherine Chappell, 29, was killed by a lion when she rolled her window down to take photographs. 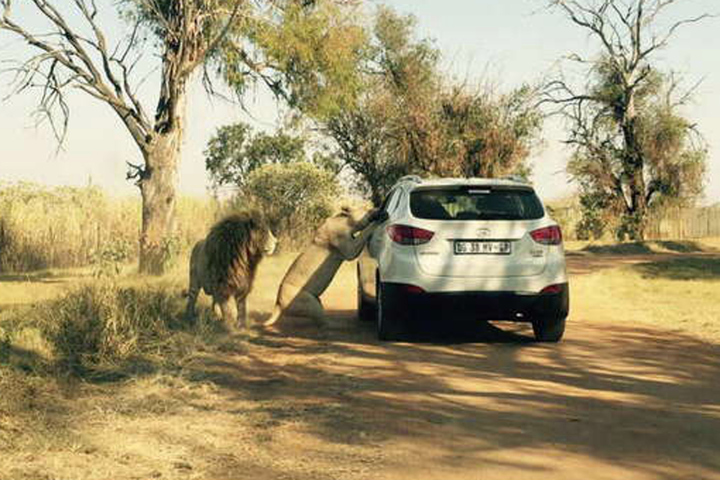 This occurred at the Lion Park, near Johannesburg, South Africa that had clear signs warning its visitors. Clear signs prohibiting open windows are found at the park. 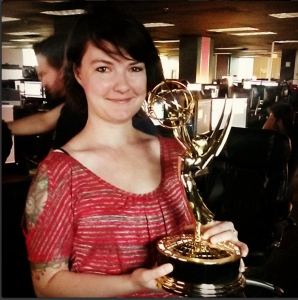 Chappell was as an Emmy-award-winning visual-effects artist on HBO’s Game of Thrones. She also had worked on Captain America and Godzilla. The white tiger at the zoo before its escape. An escaped zoo white tiger killed a 43-year-old warehouse worker on June 17, 2015. Police then shot and killed the white tiger in Tbilisi, Georgia. Severe flooding allowed hundreds of wild animals to escape the city zoo in this country that was part of the former Soviet Union. The tiger attack happened at a warehouse in the city center. The animal had been unaccounted for since the weekend floods destroyed the zoo premises. Doctors said the man was attacked in the throat and died before reaching the hospital. Source. A leopard attack on July 2, 2015, also occurred in South Africa. 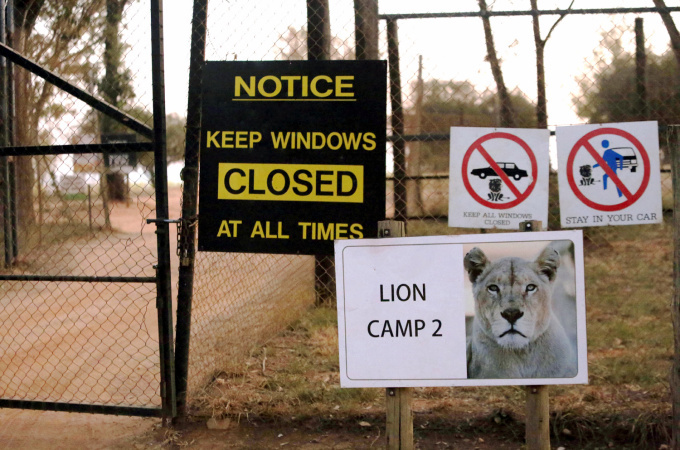 A guide at South Africa’s most famous national park, Kruger National Park, survived a leopard attack after a tourist scared the animal away with his car. The incident occurred Thursday afternoon at the wild animal game park as the guide drove an Open Safari Vehicle (OSV) past some leopards. One of the leopards was the vehicle’s group of people lost sight of it. The leopard had gone around to the driver’s side and jumped at the guide, clamping down on his arm. “Everybody in the OSV started hitting the leopard with any object they had with them,” the park said. 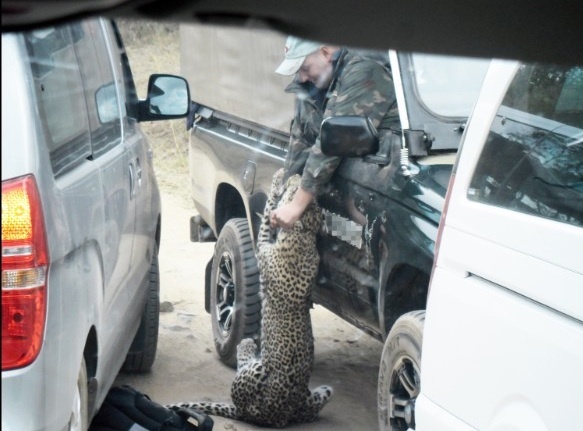 A tourist driving another vehicle raced over and used the truck to scare away the leopard. “We would like to thank the tourist from another vehicle for his quick and decisive action as he saved the guide and tourists’ lives,” park general manager William Mabasa said in the statement. The guide was treated for his injuries. Source.